There are not many rules about what “not” to do when you’re withdrawing from heroin, except not to use heroin. Yet because your health and safety are critically important, you should never use stimulants while you’re detoxifying. Stimulants are chemical substances that affect the nervous system by stimulating it. They include substances, such as cocaine, methamphetamine, Adderal, Ritalin and more. Stimulant use during heroin detoxification may complicate the clinical picture because they exacerbate withdrawal. The primary aftereffects of acute heroin withdrawal include increased heart rate and higher blood pressure. The potential hazard of stimulant use during heroin detoxification are seizures, which may be fatal. Vomiting and diarrhea are common symptoms of heroin withdrawal and both dehydrate and weaken the body. These symptoms may complicate the clinical picture for illnesses, such as the flu, asthma or pneumonia. In addition, vomitus may enter the lungs, which may cause a lung infection, which can kill you. As withdrawal symptoms disappear, tolerance drops. Consequently, those who have just gone through a detoxification program can overdose on a much smaller dose than they’re used to. They no longer know, with any certainty, what dose is safe, and experience tells us that even a tiny overdose can be fatal. In rare cases, serious complications and fatality have been reported following treatment for opioid overdose. Particularly in persons who are undernourished or have underlying electrolyte abnormalities. In these rare cases, naloxone was administered as emergency treatment for opioid overdose. The primary aftereffect was acute opioid withdrawal, including increased heart rate and respiration, which put the patient into cardiac arrest. Heroin withdrawal has the “potential” to kill, but it’s extremely unlikely. 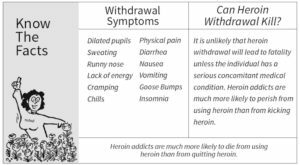 To be clear, heroin withdrawal is difficult, but typically not life threatening, especially if the individual in question is in good health. If heroin detoxification protocols are done correctly, heroin detoxification is actually very safe. What Is The Most Difficult Detox?